When it comes to booking a trip abroad, we all want a cheap holiday, or to at least stick to a set spend. But, finding great breaks that come in under budget or managing your money whilst away can sometimes prove a little difficult. So, we turned to our travel buddies on Twitter to get their top tips for travelling when money is tight and sticking too it – no matter how much those cute holiday trinkets draw you in. Q1) What are your top tips for finding a budget holiday? There were lots of great tips, but the most popular seemed to be booking out of season in order to avoid hiked prices. Luiza knows how to grab a bargain...and no we’re not biased at all. A1- don’t plan it last minute. A1. Do your research! Take the time to check different websites, is it cheaper to book hotel & flights separate or as a package? Can you take public transport instead of an expensive taxi? & don’t be afraid to be more local and less tourist! Q2) Which destinations are perfect for travellers on a budget? Q3) Any tips for sticking to a budget whilst travelling? What's the best way to keep costs to a minimum? Lots of planning and eating packed lunches seem to be the most popular way to keep costs down. #HolidayChat there's always free things to do in a city as well - free walking tours are my favourite. Just remember to tip the guides, but they are totally worth it for all the insider recommendations and to help sightsee your way around a new place! 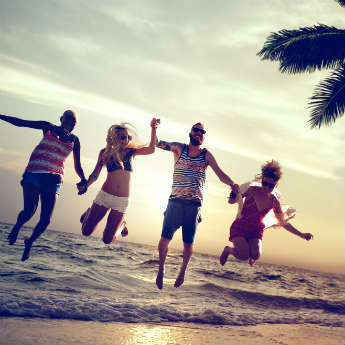 Q4) What's the best budget holiday you've been on & why? Bonus points if you include a snap! Q5) You've got £200 to book a short break and a little extra for spending money. Where would you go and what would you do to maximise your holiday budget? There were some amazing ideas on the best places to get more bang for your buck! Join us on Wednesday 18th April 2018 for our next #HolidayChat which will be hosted by a blogging friend of icelolly.com! Got a topic suggestion? Drop a comment below!